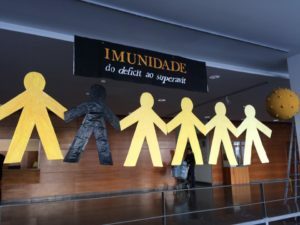 The 23rd Conference on Paediatrics, considered by the specialists as one of the biggest paediatrics events in Portugal, took place between 8 and 10 February of this year. This event was held in the Great Auditorium of the Egas Moniz Building and was directed by Maria do Céu Machado, Full Professor invited by the Paediatrics University Clinic of the Faculty of Medicine of the University of Lisbon and Director of the Department of Paediatrics at Santa Maria Hospital. There have been significant advances in paediatrics, and for this reason the Organizing Committee chose “Immunity: from deficit to surplus” as the event’s theme. 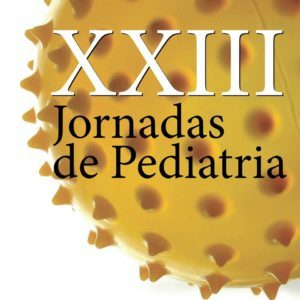 The 23rd Conference on Paediatrics was attended by about 400 specialists from the most diverse areas, such as Infection, Endocrinology, Paediatric Surgery, and Pulmonology and Neonatology, which was transmitted in real time to the paediatric services of cities such as Portalegre, Évora, Funchal, Ponta Delgada and also to the Dr Agostinho Neto Hospital, in the city of Praia, Cape Verde and to the Paediatric Hospital of Luanda, Angola. The participation of the Director of the Department of Haematology of the Portuguese Institute of Oncology (IPO), Professor Manuel Abecassis, who spoke about the importance of Hematopoietic Stem Cell Transplantation (HSCT) was also noteworthy. 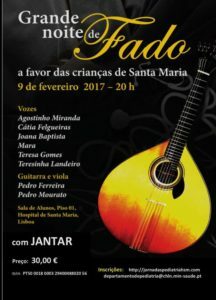 Still in the context of the Conference on Paediatrics, it is important to emphasize the Great Night of Fado, a charity event that took place on 9 February at 8:00 p.m. The proceeds went to Associação das Crianças de Santa Maria (Santa Maria Children’s Association), particularly for the Maria Raposa Paediatric Ambulatory Centre construction project. See the Programs of the 23rd Conference on Paediatrics here – Additional information here.